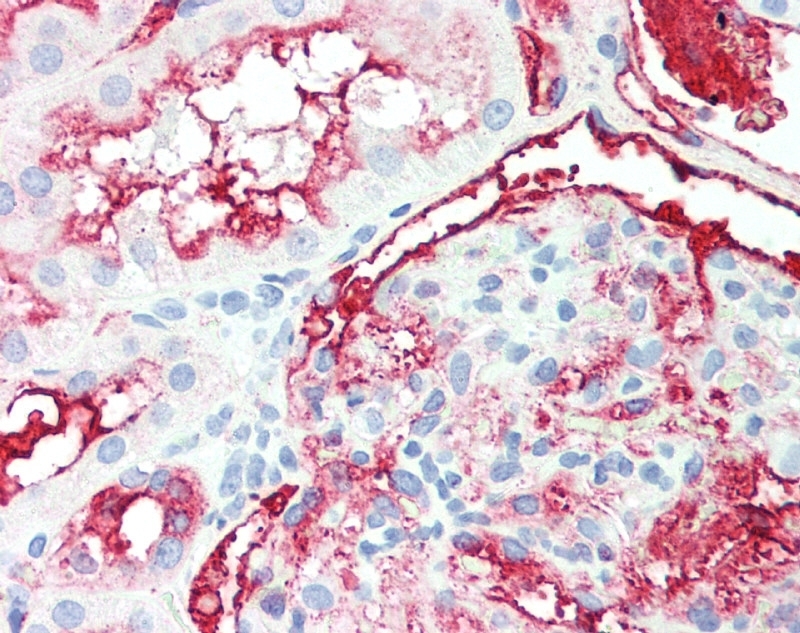 FFPE human kidney stained with Mouse Anti-Human Alkaline Phosphatase (0300-0559), biotinylated Anti-Mouse IgG and Streptavidin Alkaline Phosphatase (red). Nuclei were counterstained with hematoxylin. Mouse anti Human Alkaline Phosphatase antibody, clone BGN/03/661 recognizes human alkaline phosphatase, a hydrolase enzyme most active at alkaline pH. Mouse anti Human Alkaline Phosphatase antibody, clone BGN/03/661 detects the tissue specific isotypes, BAP, PLAP and IAP (bone, placental and intestinal alkaline phosphatase), but may react with other alkaline phosphatases. Alkaline phosphatase from human bone. In immunoblotting 0300-0559 stains a band of BAP at approximately 70 kDa.